The camera industry is moving toward SD and microSD cards for storing images, but there are still some holdouts, especially at the high end of the market, that use larger CompactFlash (CF) cards. For the ability to read those cards with the latest MacBook and MacBook Pro models, which use only USB-C ports, we tested the Iogear USB-C 3-Slot Card Reader/Writer ($20 MSRP; $16 on Amazon). 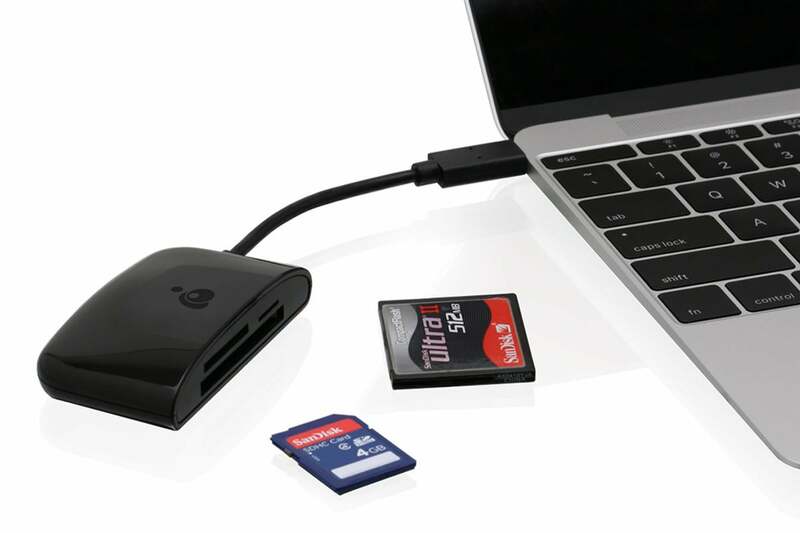 The adapter includes three ports to accommodate SD cards, microSD cards, and CF cards, with a single USB-C plug at the end of a short (3-inch) cable for connecting with the laptop. We found it to be a perfectly capable and affordable accessory, with a few quirks. The primary function of an adapter like this is to transfer image and video files from a memory card to the computer. One of the selling points of Iogear’s accessory is that it supports USB 3.1 Generation 1 SuperSpeed mode, allowing data throughput of up to 5 Gbps, or about 625 MBps. On the SD and microSD side, the Iogear adapter supports only UHS-I cards, which max out at a theoretical 104 MBps. Faster UHS-II cards include a second row of pins on the back that triple the throughput, but only work with UHS-II adapters that can read both rows. That said, we found the Iogear’s performance to be solidly in the middle of the pack of other adapters we tested, which included the Cable Matters USB 3.1 Type-C Dual Slot Card Reader and SanDisk Extreme Pro UHS-II USB-C Reader. To gauge read speeds, we copied 12.9GB of photos (684 JPEG and raw files) from a SanDisk Extreme Pro SD card rated at 95 MBps to a 2016 MacBook Pro in three passes. That resulted in an average time of 2 minutes 47 seconds, or a rate of 77.25 MBps. We also copied 32GB of video (9 files) in three passes, occupying an average of 5 minutes 59 seconds, or a rate of about 89.5 MBps. For the CompactFlash card, we copied the same 12.9GB of photos from a SanDisk Extreme 16GB card rated at 120 MBps (UDMA 7), which took an average of 2 minutes 14 seconds, or about 94.9 MBps. To test video copying speeds, we transferred 12.9GB (3 files, since this 16GB card was the only one available for testing), which took an average of 1 minute 46 seconds, or an impressive 121.7 MBps. One downside to the Iogear adapter is that it’s somewhat bulky for what it offers, and its rounded design feels like an effort to make a utilitarian tool more friendly. More surprising, in our tests we weren’t able to read more than one inserted card at a time. Mounting an SD card and then inserting a CompactFlash card would force-eject both of them, for instance. 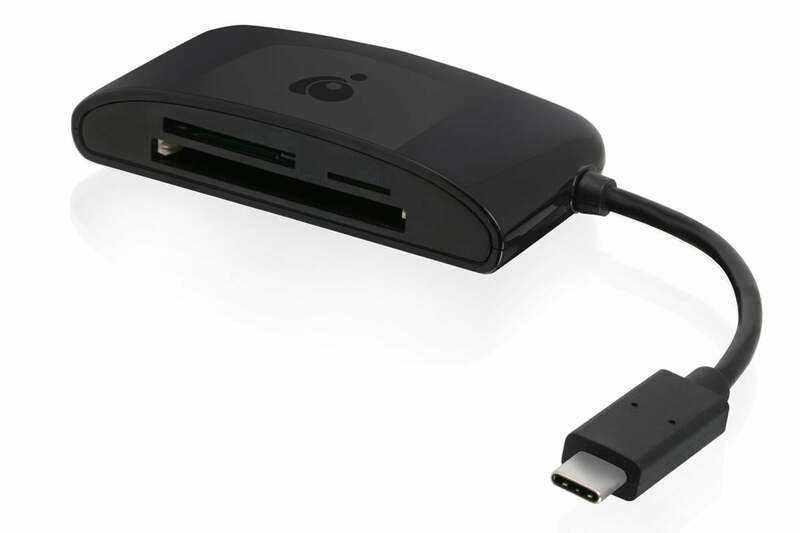 If you need to transfer data from CompactFlash memory cards, or a mix of CompactFlash and SD or microSD cards, to your USB-C equipped MacBook or MacBook Pro, the Iogear USB-C 3-Slot Card Reader/Writer handles it with good speeds in a single package.